Join the Arab Resource and Organizing Center, Break the Siege and the Center for Political Education for an educational evening, with speakers from the South Africa anti-apartheid movement of the 80s and 90s, and the Palestine solidarity movement today, looking at the rich lessons and current work fighting apartheid from South Africa to Palestine. How did boycott, divestment and sanctions (BDS) on South Africa help to break the back of apartheid? 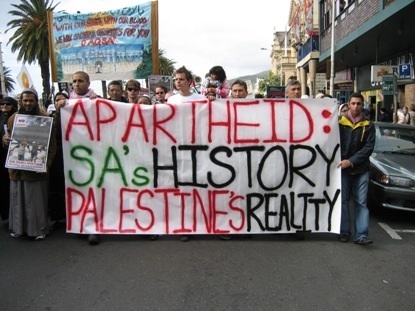 How is the anti-apartheid framework useful for the Palestine solidarity work? What do differences in the geopolitical role of South Africa and Israel mean for BDS and Palestine? What’s the significance of cultural and academic boycotts? What’s currently happening in the Bay Area in terms of boycott, divestment and sanctions on Israel? Jackie Husary is a Palestinian-American born and raised in San Francisco. She received her Bachelor’s in International Relations with an emphasis on the Middle East and Third World Development. Her thesis, “Betting on the Underdog: Why States Support Palestine” focused on Third World solidarity with Palestine specifically looking at South African and Cuban solidarity with Palestinian quest for self-determination and human rights. In her undergrad, she was actively involved in the General Union of Palestine Students (GUPS) and was its chair in the last semester. She also was a board member of the Cesar Chavez Student Center Governing Board. In Fall 2009 she will begin a Master’s program in Ethnic Studies at San Francisco State University. She currently works for the Arab and Muslim Ethnicities and Diasporas Initiative at SF State. Gerald Lenoir is a board member of the Interfaith Peace Builders, an organization that leads delegations to Israel/Palestine to learn about and advance the work of Palestinians and Israelis committed to nonviolent struggle for peace and justice. He is also the director of the Black Alliance for Just Immigration (BAJI). Lenoir was the director of Southern Africa Program of the American Friends Service Committee in Seattle in the mid-1970s and the co-chair of the Seattle Coalition Against Apartheid in the mid-1980s. In 1994, he traveled to South Africa as a journalist to cover the historic all-race elections for the Oakland Tribune and the Black Scholar Magazine.